We hardly share dessert recipes around here right? but we run sweet treats business. How strange is that?! So, we thought we should actually share sweet treats too! 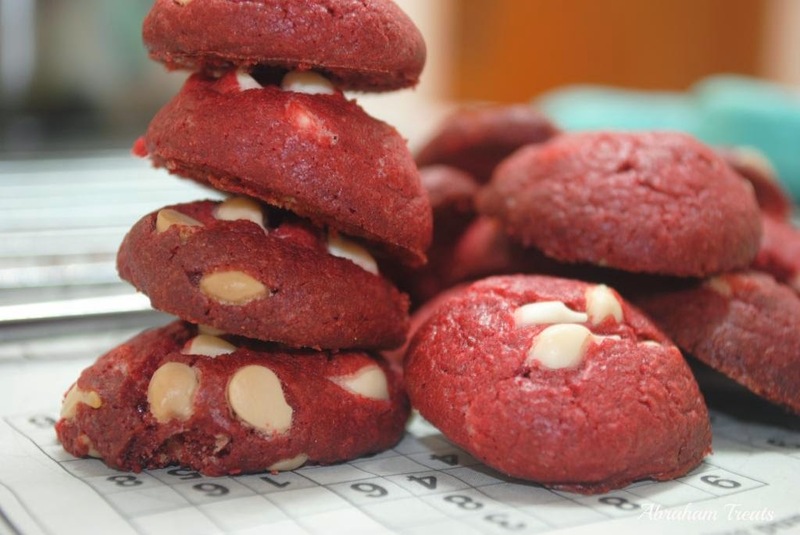 because that's what we adore more..and how full you are there's always a place for dessert in your tummy lol ..
Oh Red Velvet!!! Don't you just love it? the colour, the taste..we just can't get enough of it. 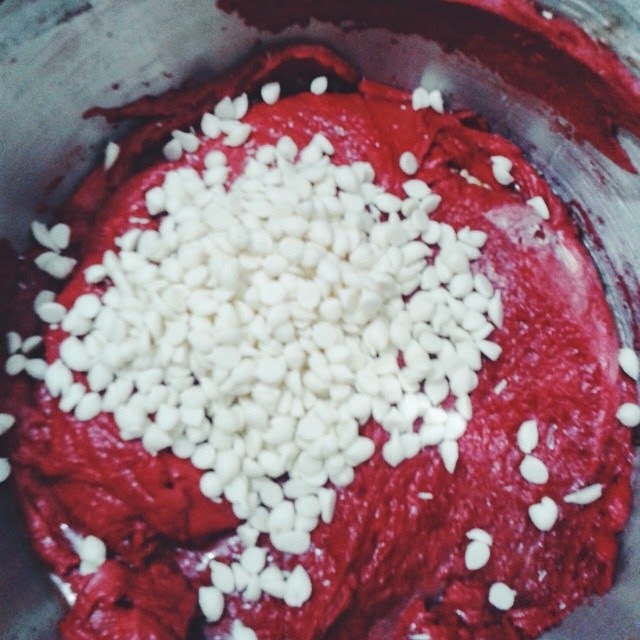 We have been baking red velvet cakes all the time. 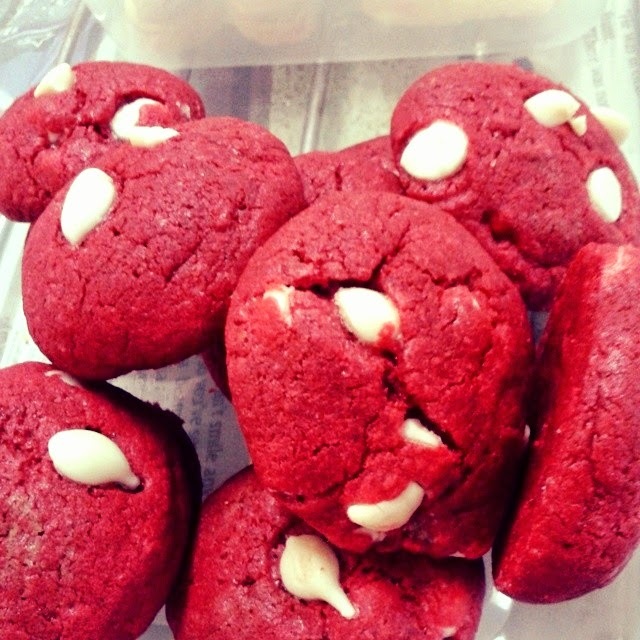 So we wanted to give a little try on the cookies..there are perfect for Christmas, valentine and so on.. In a stand up mixer fitted with a paddle attachment, mix butter and sugar on medium speed for 3-4 minutes or until pale and fluffy. Add vinegar and mix just until combined. Add the egg just until combined. Scrape down sides of mixing bowl. Add vanilla and red food coloring and combine. To the butter mixture, add half the flour, cocoa, cornstarch, baking powder and salt. Mix on low until just combined. Scrape down the sides and the bottom of the mixing bowl. I took the paddle off to really dig down to the bottom. Add the rest of the flour and mix until everything is incorporate. Mix in the White Chocolate Chips. Roll dough into ping pong ball sized balls and place on prepared cookie sheets 2 inches apart. I did not flatten them. Bake for 9-11 minutes. While the cookies are just out of the oven, gently push a few white chocolate chips into hot tops of cookies in a random pattern to garnish.